Do you want to be an investor? Good. I have seen that not everyone who wants to be successful actually makes it. 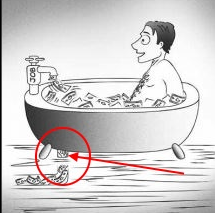 Paying down debt - or as I call it, plugging the drains in your financial bathtub - is a HUGE part of reaching financial freedom. I came across this interesting article the other day - it shares some of the main points from the classic financial book by Napoleon Hill called Think and Grow Rich. This is a really interesting article about people leaving New York City and moving into the suburbs. Might be a good time to wholesale some houses in the suburbs of New Jersey and upstate New York. You already know my feelings about a college education and how it relates to making money. In fact, Chapter 6 of my book Forever Cash is titled: Education is Good - but What Kind? If, like me, you have been closely watching the city of Detroit, then you can identify with me when I say that it has been quite a roller coaster. From mounting debt to bankruptcy to houses practically being given away, there were moments when I thought that the Motor City was done for. But this recent news article came as a pleasant surprise - Detroit is bouncing back and proving to be a stronger market than all previous estimates. Real estate investing is based on the same investment principles as other kinds of investing - buy low and sell high. When deciding which market you want to invest in, you need to find a place where people are buying.